Just kidding! You go, gals! Congrats on the "new" trademark. 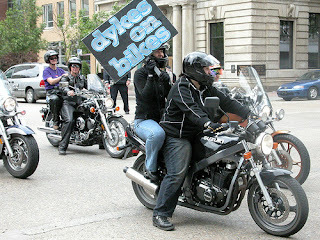 A San Francisco motorcycle club gained long-sought legal approval today for its trademark of the name "Dykes on Bikes" when the U.S. Supreme Court turned away a challenge from a lawyer who said the term denigrated men. More on the SF Gate.